Who can help me resize an image? Ok I realize this asking for help probably isn't topic worthy but I was wondering if someone could help me. 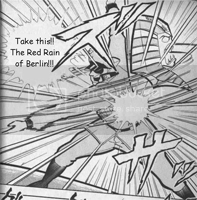 I want to use an image for a sig so I found a panel of the kinnikuman comic and cropped it but its still to big is there any way I can resize it without cropping it? Re: Who can help me resize an image? Berd is on the case! Please upload this picture to another host. I like some order in my photobucket gallery.